A Desperate Tatter: Bocher Book Model and samples. Bocher Book Model and samples. Well today was the first day of DST and it is not my favorite time of the year. It takes so long to adjust. Today I have just been tired and sleep all afternoon. I won't be staying up late tonight and tomorrow will get here way to soon. I am still driving 80 miles to go to work every day. I haven't yet seen a paycheck! It seems they are having a problem figuring out how to pay us. I hope they get it together soon as I can't afford to do this without gas money. 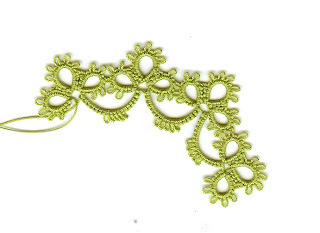 I have been working on models for The Online Tatting Class project. Here is my model of the original Four Point Star from the Bocher 1912 Tatting Book. It is the third one I have done and next one I do will be with front/back side tatting. I hope to get going on that this week. I have worked a couple of other samples from the book. They are mostly homework assignments but were fun to do. I didn't have much thread on my shuttles when I worked this piece. 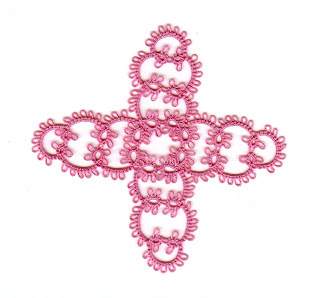 It was the modification pattern using Josephine Knots. I do like to make JK they are so different and make a nice element to a project. 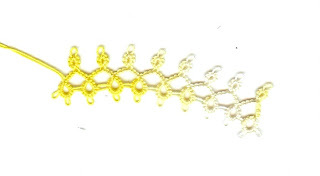 The yellow piece is left over from my yellow edging I was working on and yes, I did finally find it. The edging is complete I only have to add it to the hanky and then I can post it for all to see. This piece is the original pattern from the Bocher book. I like this one as well and may do enough to edge another hanky. And finally, the green piece if a sample from the Bocher Book. I can't use it as a model because I have an error in it. But you can see how it is working up. It is sleeting outdoors and Sadie is insisting on staying out. Such a silly little dog she is. She did miss the two deer that just wandered through the yard. I don't think she will stay out too long as it is cold. Earlier she lost a piece of a treat under the oven and she keeps scratching at the oven trying to get it. I tired to fool her and put a piece under there when she was out, but it didn't work as she is still looking. Thanks for the reminder about DST. It seems that a lot of people don't care for it! Lovely lovely work and I do hope you get paid and it happens immediately.